Hope you all had a good weekend, Valentine-y or not. 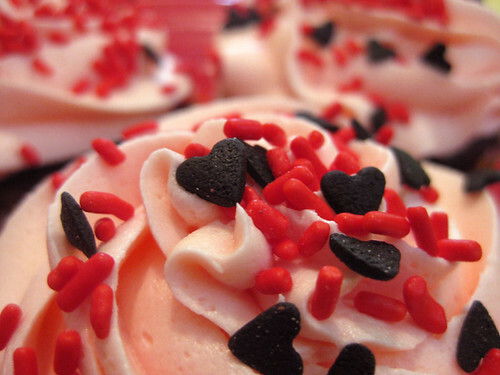 We had fun, lots of valentine's and these cupcakes. Emily found the sprinkles at Target and loved them, so she and I made cupcakes Saturday! I have to admit, I don't love the recipe I used (I don't make cupcakes that often, so I haven't been able to try many recipes, and so far none of them are keepers). It's for chocolate-banana cake and while it sounded good in theory, not so great in practice. Really I should have remembered that I have a red velvet recipe stashed somewhere I've been meaning to try -- that would have looked perfect! 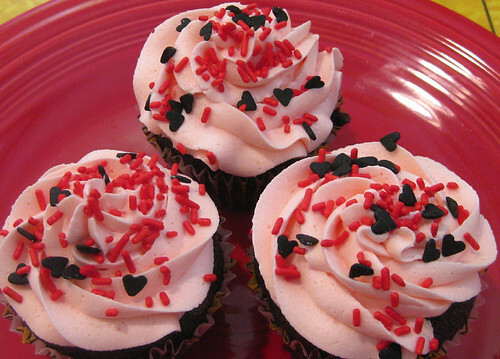 Well, there are a lot of sprinkles left, so....more sweetie cupcakes soon, I think! the mushroom invasion: I defeat them! As I mentioned, after slaying the encroaching alien mushroom creatures I covered them with a tea towel and stashed them in the fridge. The next day for lunch I picked over them (a few were a little too dry), sliced what was left and then sauteed them in butter with a teeny bit of salt. And they were SO TASTY. 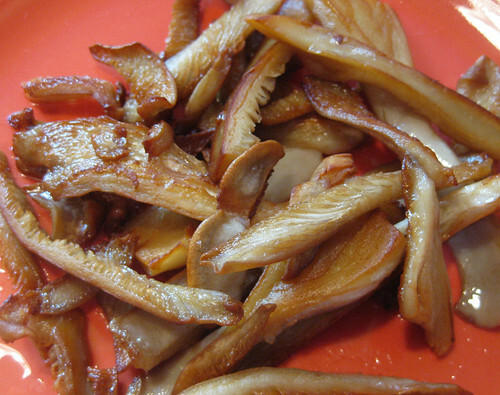 Seriously, the freshness of the mushrooms was noticeable. 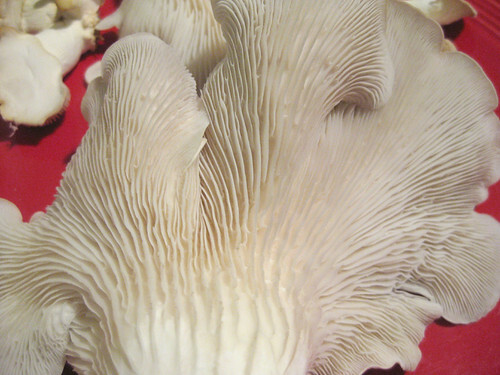 I can tell I am going to be so picky about mushrooms from now on! 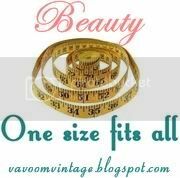 Not to mention, become addicted to growing them! Emily wouldn't eat them (her loss) and Evan was a bit freaked out but enjoyed them. (He had some crazy theory about how "average americans" think food they grow themselves is not real. Of course, he considers himself an "average" american even though he has never lived outside the five boroughs of New York City! reeee-diculous.) I thought they were delicious and only wished I had more. At the moment I'm following the instructions to dry (for a week) and then soak the log, rewrap it in plastic and attempt to grow them again. 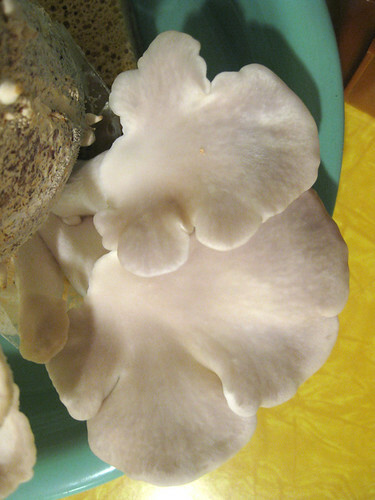 (Supposedly you can get even a 3rd flush of mushrooms!) This time I'm going to cut several slits in the plastic instead of 2 X's, so that the plastic can stay on the rest of the log even if it is bursting out all over. And we'll see what happens! the mushroom invasion: they try to take over! AAAAAAAHHHHH!!! So, we decided they had to be stopped for our own protection that minute, and I sliced off the mushrooms. Once they were all on a plate, they seemed so much more friendly. Food-like. And even pretty. But still -- that thing was huge. See? Almost the size of a very tired 4-year-old's face. I checked my big food book for storage tips, and covered them with a tea towel and stashed them in the fridge for the next day. Tomorrow, the results!! 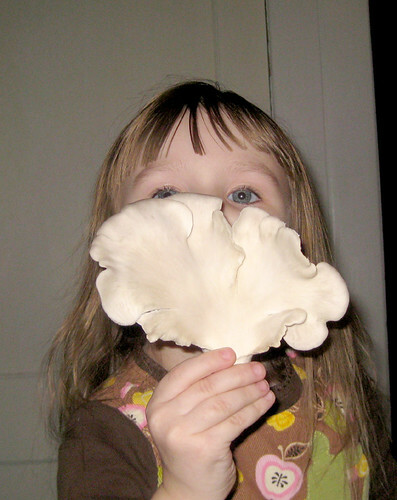 gardening in winter; or, the mushroom invasion! Emily has been super-excited about gardening this year, but we can't even start our seeds (indoors) yet, so I decided to get a little mushroom growing kit so we could grow something in the meantime. I looked at a ton of places online, but most of the kits were really big and/or pricey for something that was just a little experiment. 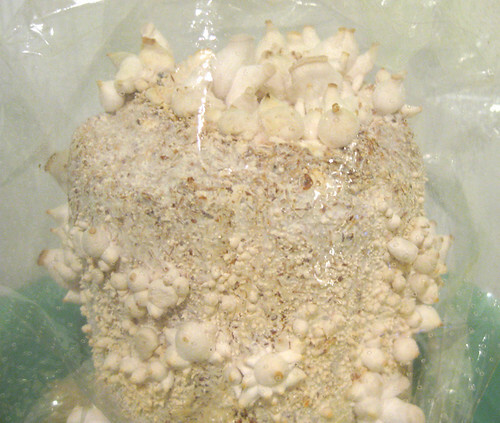 I ended up going with a little oyster mushroom kit from this place, we got it about a week ago and started it the very next day. The directions said it would take up to 21 days to start growing, so we were prepared to wait...imagine our surprise to see little buttons popping out just 2 days later! See that second photo? That mushroom is almost twice as big now. 6 hours later. I am so not joking. Unfortunately, a lot of the original caps seem to have died back, maybe because the monstrous ones are sucking the life out of them! 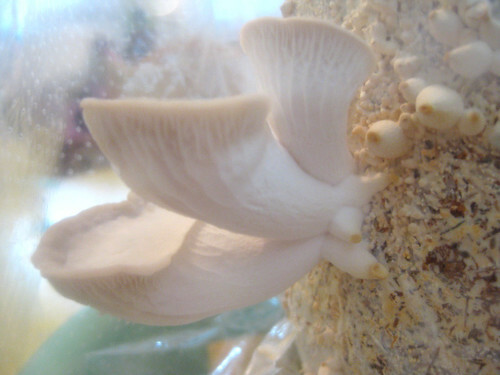 We're supposed to wait a week before harvesting, but the biggest one is now lunging out of the large dish the little mushroom log is in, so they may not last that long. Supposedly we can get another batch or two but I don't know if we can take the chance! 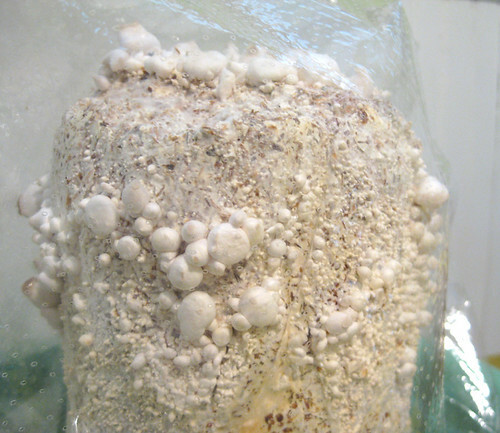 So far what we have learned: 1. fungi really grow like crazy. I wish I'd set up a tripod to time-lapse that thing! 2. next time, I will look for better instructions. I think this set of guidelines would have worked a lot better. 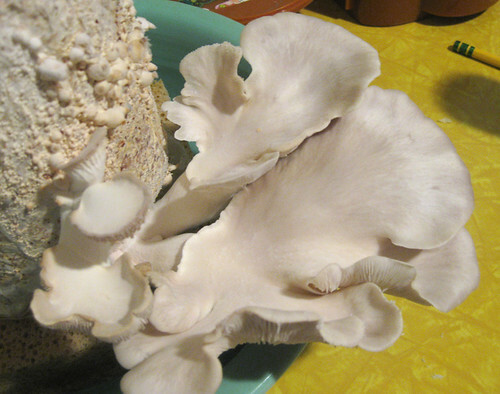 3. next time, I will also grow a mushroom I am more familiar with so I don't have to keep looking online to see if it looks like it's supposed to! Emily would be happy with plain old button mushrooms, so maybe we'll do that. 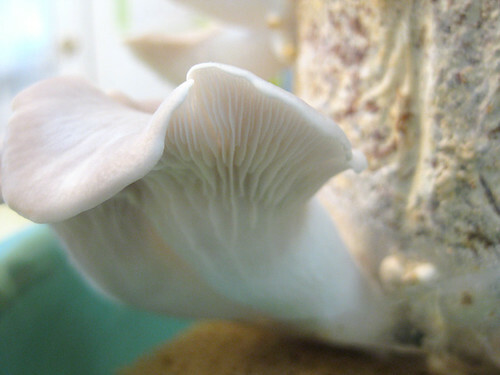 4. growing mushrooms really is pretty fun. For now, the experiment continues -- and hopefully they won't climb out of that bowl and get us Matango-style!! 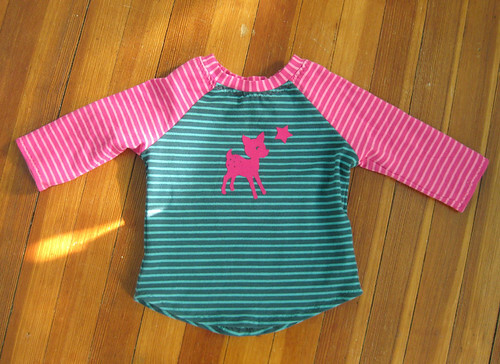 For Emily, a Zoe as well, this in blue and pink striped campan with an awesome velour iron-on -- I like this one so much I may have to make a Zoela for myself to match! I've also made Evan another Föhr this time from a heavy cotton rib knit -- it came out like a sweater, really, but I'm happy with it (and so is he!) 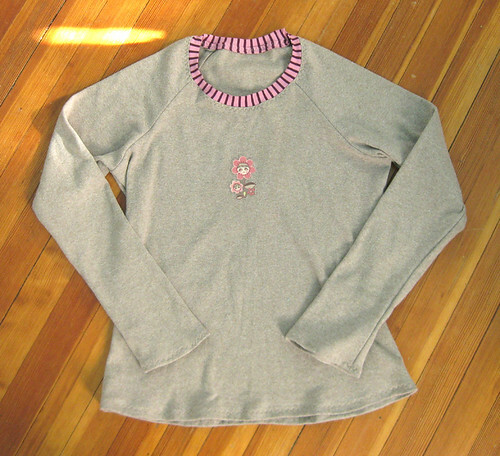 I lengthened the sleeves a bit this time and it fits much better. 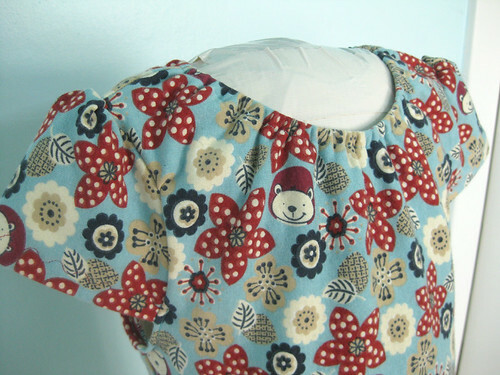 I've also been turning out pajamas left and right for all three of us -- maybe when the next set are done I'll stack them all up and take one big photo! And now....which sewing project to tackle next?! all fabrics (except the knit I used for Evan's Föhr) and the velour iron-on from Buntefabrics.